Locate the message that you wish to forward, and Left-click it once to highlight it. You can also hold the CTRL key whilst clicking to select multiple messages at once. At the top of the window select the 'Message' menu, then the 'Forward As' option, then 'Attachment'. This will open the New Message window. 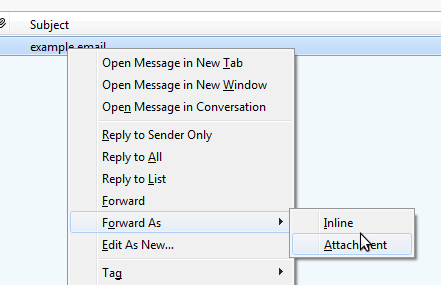 You should find the attachment(s) listed in a box to the right of the Subject: line in the New Message window.